Age-restricted communities near Baltimore enjoy many home styles, locations, and recreations. Set on the Patapsco River, which is an arm of the Chesapeake Bay, Baltimore boasts a thriving Inner Harbor area and historic shopping districts. Sports fans can take in a baseball or football game, and music lovers can enjoy jazz, opera, symphony, or other musical performances. Those who frequently visit Baltimore can even find a few active adult communities within easy distance of the city. Active adults who enjoy visiting Baltimore regularly will be happy to learn that there are several age-restricted communities located within the Baltimore - D.C. Metro area. Maryland's nearby active adult communities include Central Parke at Victoria Falls in Laurel and Chesapeake in Easton. Baltimore is also an easy day or weekend trip from some of the communities in neighboring states, such as Independence in Millsboro, Delaware and Potomac Green by Del Webb in Ashburn, Virginia. 55+ communities in the Baltimore D.C. Metro area lie within a humid subtropical climate. Residents enjoy a four-season climate with hot summers, cold winters, and a warm spring and autumn. Depending on your location, the average winter season's snowfall is about 20 inches with spring as the wettest season. Active adult communities in the Baltimore D.C. Metro area are located in a region that includes Central Maryland, Northern Virginia, two counties of West Virginia, and one county in Southern Pennsylvania. 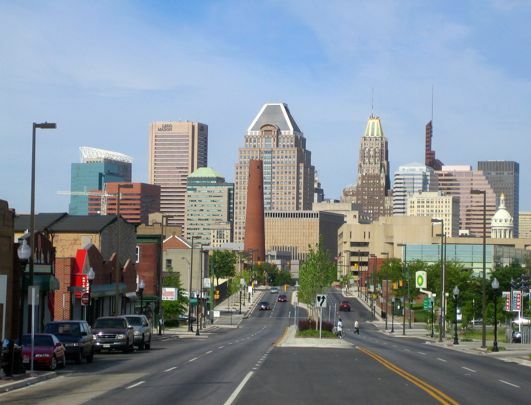 The cities that mostly make up the Baltimore area include Aberdeen, Annapolis, Columbia, Towson, Ellicott City, and Owings Mills. The Washington area includes D.C., Bethesda, College Park, Frederick, Gaithersburg, Laurel, Potomac, Rockville, Silver Spring, Upper Marlboro in Maryland and Alexandria, McLean, and Reston in Virginia. Although downtown Baltimore is the city's main commercial area, Baltimore includes many neighborhoods with their own attractions. The city's architecture is displayed through its many historic buildings, such as the Phoenix Shot Tower, the Sun Iron Building, and the Baltimore Basilica, which is the oldest Catholic Cathedral in the United States. Though downtown Baltimore has much to offer, tourists often spend more time visiting areas such as the Inner Harbor and Fells Point. The Inner Harbor is Baltimore's liveliest tourist spot. This bustling waterfront houses shopping centers, restaurants, museums and hotels. The National Aquarium and Oriole Park at Camden Yards are two of the Inner Harbor's hottest attractions, though visitors can also enjoy locations such as the Maryland Science Center and the nearby American Visionary Art Museum. Many historic ships are also open for tours, including: the USS Constellation (Civil War); the USCGC Taney (Pearl Harbor); and the USS Torsk submarine (World War II). Neighboring Fells Point, founded in 1730, is a tranquil counterpoint to the vibrancy of Baltimore's Inner Harbor. Though this historic district is only a short water taxi ride, or one-mile walk from the Inner Harbor, Fells Point maintains its distinct charm with cozy shops, historic points of interest, and its share of local ghost stories. Visitors at Fells Point will enjoy a stay at the Admiral Fell Inn, a European-style hotel set within two (now attached) historic row buildings. The surrounding shops, restaurants and nightclubs include unique locations like The Horse You Came In On Saloon. Baltimore also offers several walking tours, such as the Fells Point Ghostwalk. Known as the birthplace of the National Anthem, Fort McHenry is a popular Baltimore point of interest for both visiting tourists and local residents. Fort McHenry's rich history makes it a significant landmark for the American Revolution, the War of 1812, the American Civil War, and World War I. In addition to self-guided walking tours, Fort McHenry offers scheduled events such as twilight tattoos, concerts, and flag changing ceremonies. Though the cost of living in Maryland is higher than the national average, the overall cost of living in Baltimore is lower than the average for the state and nation. While the index for utilities, transportation, healthcare, and groceries cost more than the national average, the housing as well as goods and services index are both lower. Maryland as a state collects a higher than average sales tax, estate tax, and gas tax. They enforce five income tax brackets that range from 2 to 6.25 percent of personal income. Baltimore and all 23 counties have an additional state income tax rate as well. The state sales tax is six percent and all properties are subject to a property tax. Age-restricted communities in the Baltimore D.C. Metropolitan area enjoy access to great healthcare options. There are 30 hospitals in the Baltimore, Maryland metropolitan area and 13 are rated as top-ranking facilities. Johns Hopkins Hospital, Mercy Medical Center, University of Maryland Medical Center and Sheppard and Enoch Pratt Hospital are ranked nationally for numerous specialties.